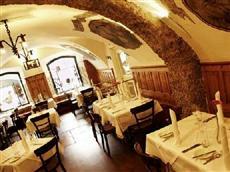 This Salzburg hotel is located in the heart of the city center, on the world famous Getreidegasse. Many attractions are within walking distance of the Arthotel Blaue Gans Salzburg, including the Mirabell Gardens, the Hohensalzburg Fortress, Mozart's birthplace, the Salzburg Cathedral, the Marionette Theatre, and St. Peter's Monastery. The Salzburg airport is located less than five kilometers from the Arthotel Blaue Gans Salzburg and the train station is approximately three kilometers away. Public transportation is readily available, as are taxi services. Most points of interest are within walking distance from the hotel. The guest rooms of the Arthotel Blaue Gans Salzburg offer several comforts, including an alarm clock, a mini-bar, and a flat-screen satellite television. All rooms have en suite baths with hair dryers and bathrobes. Every room in the facility is non-smoking. The Arthotel Blaue Gans Salzburg is believed to be the oldest guesthouse in Vienna. The facility has been completely remodeled and offers many modern amenities, including a bar, a restaurant, a wine cellar and laundry facilities. Business travelers may avail of the meeting rooms and Internet services. A fully equipped sports and leisure center is also available.